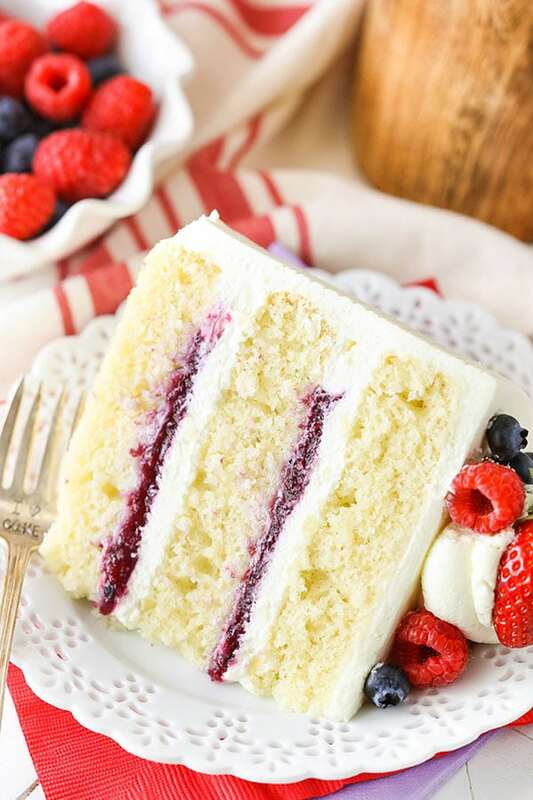 This Berry Mascarpone Layer Cake has layers of fluffy vanilla cake, fresh berry filling and mascarpone whipped cream frosting! It’s light, fruity and perfect for spring! I never really realized how much of an effect caffeine has until I stopped drinking it recently. As part of the IVF process, caffeine isn’t really recommended so I’ve been doing my best to not drink it. Since soda has less caffeine than coffee, I’ll have a little if I’m desperate. I’d rather have coffee though. 🙁 Much more yummy. Point is though – the lack of a picker-upper is brutal! And the tiredness is making me crave a way to increase energy so now I just want to eat all the carbs and sugar, which I’m also avoiding. Sometimes I feel like I just can’t eat anything. It’s not a good situation. I’ve gotta find a way to muster up some energy! My go-to move right now is to play some of my favorite music and dance around while working. Gets the blood flowing and pumps me up. 🙂 Yay for 90s music! That’s my era. And this is my cake. This cake starts with a moist and easy vanilla cake. The batter is so easy to put together, you could simply use a whisk to combine everything if you wanted. I always love a good stand mixer – it takes the work out of it for you – but you could do it by hand. Just combine the dry ingredients and wet ingredients separately, then add them all together with a little water. Done! Plus, the ingredients are all nice and straight forward. Rock on. Then there’s the berry filling. You could almost think of it as a homemade jam, but not quite as thick. I used an even mix of strawberries, blueberries and raspberries, but you could use whatever combo you like. The berries are purred in a food processor, then cooked over heat with some sugar and cornstarch. The heat reduces the liquid a bit and the cornstarch helps thicken everything. Once it’s cooled, you’ve got the perfect berry filling! The mascarpone whipped cream frosting is used both to add to the cake filling and to frost the cake. I love how light this frosting is! You basically make whipped cream and add mascarpone cheese to it. The mascarpone flavor is lighter than a more straight forward mascarpone frosting, but this version runs much less risk of getting a super soft mascarpone frosting. Just be sure to add the full amount of powdered sugar to make sure the frosting stays stable. It makes a great addition to the cake and keeps things light and fresh! The final cake is perfect for spring, Easter and all through the summer! It was a huge hit! 8. To make the berry topping, add the berries and water to a food processor and puree until smooth. You should end up with about 2/3 cup puree. 9. Combine the sugar and cornstarch in a medium saucepan. Stir in the berry puree. 10. Cook over medium heat, stirring consistently until mixture thickens and comes to a boil, about 8-10 minutes. 11. Allow to boil for 1 minute, then remove from heat. Refrigerate and allow to cool completely. 12. Add the heavy whipping cream, powdered sugar and vanilla extract to a large mixer bowl and whip on high speed until soft peaks form. 13. Add the mascarpone cheese to the whipped cream and whip until stiff peaks form. It will happen fairly quickly. Set whipped frosting in the refrigerator. 14. To assemble the cake, use a large serrated knife to remove the domes from the top of the cakes. 15. Place the first layer of cake on a serving plate or a cardboard cake round. Pipe a dam of frosting around the outside of the cake. I use Ateco tip 808 for the dam so that it’s tall. 16. Spread half of the berry filling evenly on top of the cake layer, inside the dam. It should fill the dam about half way full. 17. Add some additional mascarpone frosting to the top of the berry filling and spread into an even layer to fill in the remaining dam space. 18. Add the second layer of cake and repeat the filling layer with the remaining berry filling and additional mascarpone frosting. 19. Add the final layer of cake on top, then smooth out the frosting around the sides of the cake. 20. Frost the outside of the cake, then use an icing decorator (I use this one) to add a striped pattern to the sides. 21. 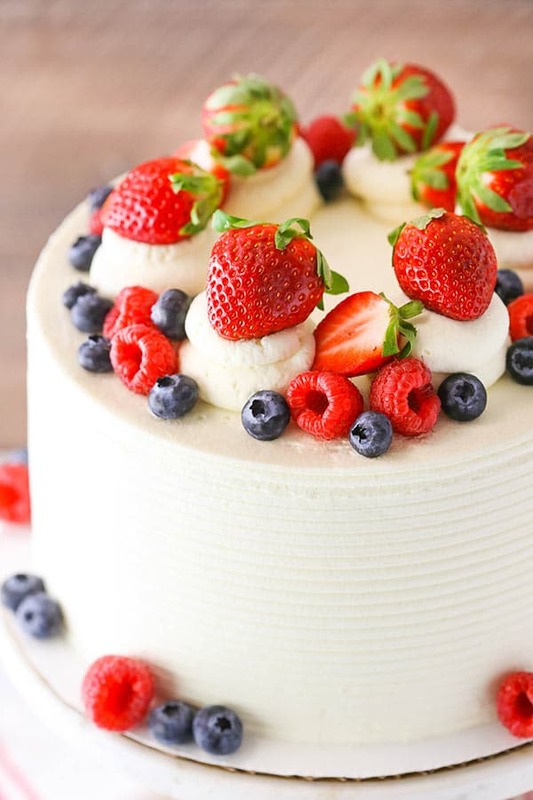 Finish off the cake with some swirls of frosting and fresh berries. 22. Refrigerate cake until ready to serve. Cake is best for 2-3 days. Such a gorgeous cake! I can’t wait to make it! The cake recipe reminds me of your moist vanilla cupcake recipe, which I LOVE so much. Yes – same recipe in cake form. 🙂 I hope you enjoy it! I tried.. I don’t know what happened but my frosting curdled as I mixed it. I’m going to use as a filling over fruit but will make another type of frosting to cover cake. I tried to frost a piece of the cake I had cut off top and the frosting slid off my knife. Help. I followed recipe to a T. Before I added the cheese it was making nice soft peaks. When I started mixing it after it looked like cottage cheese without the limps. Very tasty though. I used vanilla bean paste and it is yummy. Did you give it a stir with a spatula after mixing? It can look a little lumpy or so when mixing, but should be fine. Sounds like it may have been a little thin – did you use the full amount of powdered sugar? Also, not sure if you used a hand mixer or stand, but I find the stand produces a firmer whipped cream frosting. Water and milk have different fat contents. You could try using just milk, but it will change the texture of the cake. Does it matter which % milk should be used then? 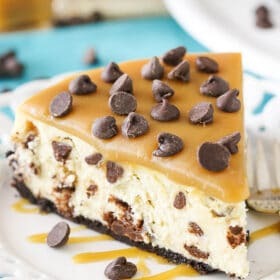 I would like to make this cake but square instead of round, Would I need to make any changes in the recipe? Square pans should be fine. I would make sure they are about the same size as the 8 inch cake pans. I hope you enjoy! Wow Lindsay! What a gorgeous cake! How ever do you keep your cake layers from getting too brown? I love just how light they came out! What’s your secret? I love your book, by the way. Best wishes with your IVF! I don’t usually have an issue with browning. They’ll get a little golden on the sides, but that’s pretty normal. I don’t do anything special. I do use light colored pans. Darker pans can produce more browning. Yes, it’s a fairly thin cake batter. This cake looks absolutely gorgeous! 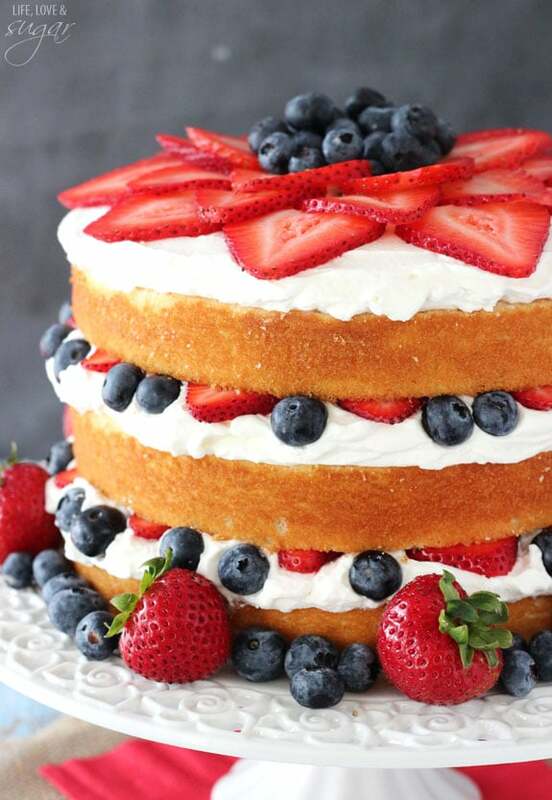 i’m planning to make this particular cake for my birthday since berries are in season in California! I was just wondering if you measured your ingredients by weight when you made this cake or any recipe of yours in general. Also, is there any mascorpne cheese alternative cause it seems like the stores near me don’t sell them :/ I’m a long time subsciber and can’t wait for your new recipes! Yes, I always weight my ingredients for the ones where weight is indicated. You can substitute cream cheese for the mascarpone, if you’d like. Hello I can cook this cake in a mold instead of three and the cut after? I am only one mold so the preparation of your cake can wait for the other cake cook if I made 3 cupcake? I wouldn’t suggest baking it all in one pan. I’d do at least two layers. Hello I can cook the cake in one go and the cut after? Because I am only one mold I can cook one by one the three cake the preparation will always be good? Ii wouldn’t suggest one big layer. You could get by with two though. Beautiful cake. I was wondering: I really enjoy tall cakes. Do you know how tall or how many cups of batter your recipe makes? Can this recipe be easily doubled? Thank You. This cake should be around 3.5 inches tall. I haven’t doubled it before, but I’d think it’d be ok. I actually measured the batter to make sure my 3 layers were even; and it makes roughly 6 cups. Can I use melted butter instead of vegetable oil in this recipe? Can use buttermilk for the milk part of the recipe? I don’t think the butter would produce the same result, but you could try it. I also haven’t tried the buttermilk. If you’d prefer a butter-based cake, you could try the cake layers from this cake. Can you pls tell me where did you get that scraper? Thank you! Thank you – I hope you enjoy it! You can find the icing smoother here. Looks awesome and sounds delicious! Will try it this month and post the results! Thank you. The recipe says 2.5. cups or 325g of flour. The sugar is only 2 cups yet 414g? Is there an error on the quantities? Nope, it’s correct. Flour and sugar weight differently. Is there a way to save the videos for future and also to send them to a friend who isnt on FB? I’m not sure that there would be a way to save them outside of Facebook. I do have a page where you can find the posts/recipes with videos and will soon have a video gallery where you can view them all and that should include some options for viewing your favorites. Can almond milk be substituted? I haven’t tried it. It should be fine, but almond milk has different a fat content than regular milk, so it will alter the texture a bit. Great to know! Thanks Leanne! I made this cake and it came out delicious. It was light, flavorful and moist. It was well-balanced with tartness and sweetness. The mascarpone frosting was also very flavorful except I did have some small pieces of mascarpone that didn’t seem to fully mix in. I scooped it directly out of the container so im not sure if i should have stirred it beforehand. However, I would definitely make this again! I’m so glad you enjoyed it! Maybe try whipping the frosting a little longer to try and get rid of the lumps? I also added mine directly out of the container. There could be differences between brands though. Another option would be to let it soften just a bit. Not too much though, since mascarpone can get too soft very easily. Thoughts on coconut oil in place of the vegetable oil?? Hard to say without trying it. I haven’t tried it. Just wondering if this cake will hold up if made a day ahead of time? How stable is the frosting? Thanks! Yep, as long as you use all the powdered sugar (which stabilizes it), it should be fine. Mine help up perfectly for several days. I made this cake for dinner guests this past weekend. It was a hit! They said it was beautiful AND tasted wonderful. Everything comes together easily. The frosting was a pleasure to work with, tasty, and balanced out the sweetness of the cake. The filing was yummy, too (much spoon licking there!). Thank you!!! Wonderful! So glad you enjoyed it! Thanks Tammy! Would the cake be okay if made a day ahead of time? I see the recipe says “best for 2-3 days” but I’m wondering how well the frosting and berry filling holds up? Thanks! Yes, definitely. The filling is very stable and as long as you add the full amount of powdered sugar (it stabilizes the frosting), it should be fine. If you’re concerned, you could even add a touch more powdered sugar to make it a bit thicker. I had mine in the fridge for a couple days and it was great. I made this cake over the weekend. Twice (cuz it was so good the first time I had to share at work).. but my local store was out of the cheese so I googled how to make it. The frosting came out “soft” even after keeping it in the fridge all day before putting it on the cake. Is this typical? I tried to make the cute swirls to put a strawberry on top and they just squished down… Is this because I make the Mascarpone cheese or do I need to put more sugar maybe? Is there a trick Im missing? When you say you googled how to make it, do you mean you made mascarpone cheese at home? If so, perhaps the consistency of the cheese had something to do with the frosting result? If you can’t find mascarpone in the future, you can use cream cheese instead. Also, be sure to use the full amount of powdered sugar in the frosting – it is a stabilizer. Would frozen berries be okay? They should be. Just defrost them and pat them dry first. This looks gorgeous AND delicious! I’m thinking of making a 12″ round version for a reception for 30+ guests. Can you tell me if the frosting makes just enough for the version above, so I would definitely want to double it for the double sized cake, or if makes excess already and I could pare that back a bit? It doesn’t sound like an excessively large batch, but sometimes I’m in shock at how much extra frosting a recipe will make. Thanks!! Gosh, I feel like what what is “enough” frosting varies by person. I am more heavy handed at frosting and I did use all of the frosting for the cake. You may want to just test it out and see what your preference is. This is definitely a moist cake. I have made it as a 9×13 and it was fine. I’m not sure about larger than that. This cake is so, so gorgeous! I’m a little confused by the yield. What size cake does this recipe make? And do you know how many cupcakes that would translate to? Thank you! It’s an 8 inch cake, about 3-4 inches tall. It would be about 24 cupcakes. Thank you so much! I used this as the base for my niece’s birthday cake, and it was a hit. So versatile and delicious! No, it isn’t 3-4 inches tall. Each of the three layers is over an inch then there is the filling and the top icing. It’s about five inches tall. This cake was delicious! I made it true to the recipe, which is rare for me, and it came out moist and delicious. The frosting was delightful. The layers all paired well with one another. I’m so glad to hear you enjoyed it! Thanks Ren! Can I use frozen fruit. And I cannot get that cheese here in Puerto Rico. How else can I use a frosting. Recipe? Frozen fruit should be ok, just be sure to defrost it and pat it dry. You can replace the mascarpone with cream cheese. I see some have made a 9 x 13….So, then do I slice the 9 x 13 in half and fill? You certainly could do it that way. Here’s instructions for this cake as a 9×13. I baked the cake according to the directions, but when I tried to cut off the domes, it was so moist it just kind of crumpled up on itself. The cakes all came out pretty even so I didn’t try it on any of the others. I’m wondering if I just didn’t bake it long enough. One other thing, I’m using a gluten-free flour. I’ve been using it (cup for cup) for years without any issues. Could it be related to that? Or just add extra baking time? I appreciate any help you can give me. Did the cake seem undercooked? If not, I wouldn’t think you’d need to bake it longer. I haven’t used gluten free flour before, but I do know that gluten is a binder and if things were kind of falling apart, it is possible that the flour had something to do with it. I can’t say for sure though, having not ever worked with that kind of flour. Is this the berry chantilly from Whole Foods? I haven’t ever had that cake. It sounds like it must be similar, but the recipe isn’t the same. I don’t know what their recipe is. No its the Chantilly from Publix. My cake did not come out fluffy. It was kind of dense. I made it twice to be sure of the result. The amount of eggs used is entirely dependent on the other ingredients in a recipe. I’m not sure why it’d be dense. It could be some difference in our ovens? I’m really not sure. I made this cake today and I too was surprised at the density of all three layers. I can best describe it as a dense, toothesome, shortbread cake. I was not expecting the density at all. No fluffiness or spring to any of the layers. It is not necessarily a detraction, just a surprise. Here is what concerned me: I knew that my baking powder was expired, so I chucked it in anyway. That, mixed with elevation in Germany…is probably why I ended up with a three-layer pound cake. The berry compote and icing are GREAT! I’m sorry the cake didn’t turn out quite right. It definitely shouldn’t be dense or shortbread-like. I made the cake two weekends ago too and it came out dense. Followed the recipe to a T. Had to to set the oven timer for five more minutes three more times. Still came out like a lump. Just curious if you are measuring your flour correctly? A tablespoon extra of flour will make your cake dense. My cake also turned out dense and wondering why it happened. Perhaps there is too much liquid in the recipe? I truly don’t know why some are having trouble. I’ve had so many people have success and share photos of the final cake with me that I know the recipe itself is fine. Perhaps there’s a difference in elevation or climate that is making a difference for you? You could certainly try leaving out some liquid. Perhaps it’ll make a difference. I grew up in the UK and my mom could not use American cake recipes with success, and we figured out it was a difference in the flour there than in US. Everything came out very dense. So if anyone is making this in a country outside the US, the ingredients may not correspond exactly. Thought this might help! I also googled how to make the mascarpone cheese. My icing also seems soft. I used all the powdered sugar the recipe called for, could I add more powdered sugar to make it more stable? Is there a certain amount of time that the icing should be refrigerated? Thank you so much.. This cake reminds me of one my grandmother used to get from the bakery on SPECIAL occasions. I have no experience with homemade mascarpone, but just looked it up to see. I don’t know what the final result is like, but it could be a factor. You can try adding more powdered sugar, it shouldn’t hurt it. In the future, another option would be to swap it out with cream cheese if the homemade mascarpone doesn’t result in the best frosting. I used store bought mascarpone and my frosting never really got firm. I even added extra powdered sugar based on the recommendations here in the comments. Might be that my German products don’t have enough fat in them. I dirty iced and put everything in the freezer. Waiting till the last minute to do the final frosting and decorating. Hi there! I only have two 9 inch pans. Would you recommend splitting the dough evenly between the two pans or still splitting it 3 ways and baking 2 first and then a third once the first are done? Thanks! I think either way would be fine. I ended up doing 2 9 inch layers. Everyone loved the cake!! It was professional quality! Thanks for a fantastic recipe. Happy Easter! It’s the perfect Easter cake! Recipe was easy for me to follow, I am not a great baker, but maybe I am now!!! The only trouble I had was trimming the cake dome off cakes, lacking skills, filled in with heavenly marscapone icing!!! It is the best frosting I have ever made! Proud to be serving this for family gathering! Beautiful! Awesome! So glad you’re happy with it! OMG, this looks so yummy. Wish I can make this beautiful looking cake. So, I made this cake this morning. Hoping it tastes better than it looks! The frosting flavor is heavenly, but how the hell did you get it to that consistency? My frosting is very light and fluffy, so I just couldn’t get it to be smooth like that – what is your secret? I’m not sure where the issue is. My frosting is also light and fluffy. It’s basically whipped cream with powdered sugar for stabilization and sweetness and some cream cheese for flavor (and also a stabilizer). My layers did not come out as thick. Would you know why? After letting the cake set up in the refrigerator, I then added the fruit, it worked just fine. We had it for Easter and we got awesome reviews. Great recipe. Thank you for your input and advice. I saw the video for this on Facebook, and I knew it would be perfect for Easter. I’ve never attempted something like this before, but it turned out great! A few things: I couldn’t find 8″ pans, so I used 9″ and baked for 22 min. The layers were kind of thin, but they worked. I was kind of worried that there wouldn’t be enough Berry filling, so I used two cups of berries and adjusted the water, sugar, and cornstarch accordingly. I liked having the weighted measurements on there, but I think the one for the heavy whipping cream may be off. My scale showed 2.5 cups as being 578mL. I didn’t want to try to get to the 720 and ruin things, so I just did 2.5c. That was easily the best frosting I’ve ever made. Wow! I did notice, and this is probably a matter of preference, but I feel like the flavors shined through better after sitting out a little than just out of the fridge. I had Berry filling and frosting left over (which is not a complaint 😉 ). Awesome cake. Highly recommended. I realized I had 9 1/2 inch pans not 8 “. Worked anyway. Everyone loved it not a piece was left! Beautiful cake. Just wanted to say that i made this as a trifle instead. Omitted the berry puree. I just baked the cakes as mentioned. Made the frosting as is. Diced cake in bite size pieces. 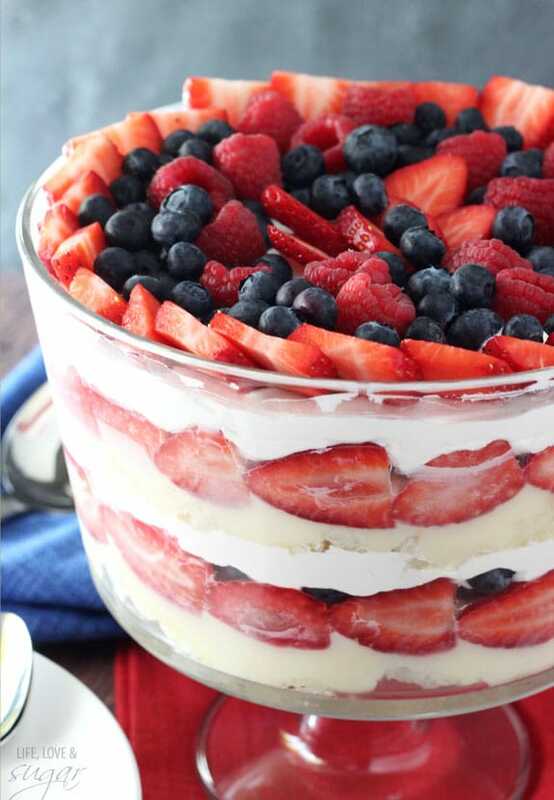 Then layered them in the trifle bowl using blueberries,raspberries, and sliced strawberries in between cake pieces and delicious mascarpone frosting. Everyone at Easter Dinner Raved. Great idea! Glad it was a hit! I would think so. You could use the berry puree as a filling – maybe add a little whipped cream to it or something to give it some volume? Made this for Easter and it was amazing! I made two changes however. I added lemon zest to the cake batter and I used a mixed berry jam for the filling. The sweet and the sour played off so nicely. Highly recommend and definitely a new family favorite! I’ve been desperately trying to find a really good vanilla recipe that uses veg oil instead of butter and this ones sounds yummy! I’ve tried COUNTLESS recipes and all of them end up tasting like flour 🙁 I mean no sweetness to it. I tried this one last night and I feel like I’m still struggling with that. I read somewhere about measuring the flour wrong because I was using my measuring cup to measure the flour so I now have a new batch in the oven that I measured “correctly”. Hoping it comes out good! Any suggestions??? Also… tried the berry recipe also and it is phenominal! I mixed it with some of my buttercream recipe and it was YUM!! Yes, measuring the flour accurately is very important. I include measurement in grams because I actually weight it just to be sure. A food scale can be purchased for relatively inexpensive, if you’d like to try it. Usually you can find one at Target or similar places. I made this for friends last weekend… none was left! It came out wonderfully. I had no issue with sticking, at all. I am making it for this Friday for my daughter’s small reception after her wedding. There are only 10 people. There will have to be a tweak of lactose free milk and I’m going to make an amoretto ‘buttercream’ with Earth Balance butter. Should be good! So glad to hear it was a hit! Thanks Jeananne! I made this cake last Sunday for my birthday/Easter, and it was a success ! If using this recipe to make cupcakes, how do you fill the cupcakes with the grit filling? While this cake tasted delicious when covered in frosting and layered with fruit filling, the cakes came out sort of “wet” and dense and without a real dome. I did not make any substitutions except for using frozen berries which I thawed before pureeing. The batter was much thinner than I am used to in a cake batter. Unless you have other suggestions, I may try this again with less or maybe no water at all. 2 cups of liquid plus oil just seems like too much liquid. It is a very thin batter. Did you test the cakes with a toothpick before removing them from the oven to make sure they were done? I use a toothpick and stick it in the center. There should just be a few moist crumbs sticking to it when the cake is ready. Im going to make this cake for a birthday party but I dont have 8 inch pans, I was thinking about making it in 3 9.5inch pans instead (24cm). Would that work do u think? I think it would make fairly thin 9 inch layers. You might want to use 1 1/2 recipes worth for a full 9 inch cake. HOw long do I let the icing chill? I made it about a half hour ago. It depends a little on your frosting. If the mascarpone was cold when added, it should be good to go and may not even need to be refrigerated. If it’s soft, you might need to. Sorry if that isn’t terribly helpful. I am an experienced baker and this cake has more than 1 component that does not work. The cake itself comes out flat and dense. And yes, I followed the instructions to a “T”. Is baking soda missing ? The fruit puree is way too sweet. I cut it with lemon juice. I will remake the white cake using a different recipe. I’m sorry you were disappointed, but I can assure you that the entire cake does work. I’ve made all the components of it many times without problem. I decided to make this cake for my son’s birthday. Followed directions exactly, however I also did not have 8″ cake pans and used 9″ instead. The cake was thin, did not rise, and was so dense it was almost like cookie dough. Not edible. The berry filling – seemed to me that 3 tablespoons cornstarch was way too much for the amount of puree called for in the recipe and sure enough, the final product of berry filling was very thick and when cooled was more like solid jello rather than spreadable. By the time I got to the frosting, I decided to only make half a batch just in case it didn’t come out good since by this time I had lost confidence in the entire recipe. The frosting however was the only thing that came out well. Bottom line, I went to the bakery to buy a cake. I will keep searching for a tried and true vanilla/yellow cake recipe. I made the cake and used 9inch pans and my layers also came out kind of thin, but what I was wondering was, Is the cake batter supposed to be such a thin consistency? Mine seemed so thin and watery that I ended up mixing in about 1/2 cup more flour before adding to pans, might explain why my layers were flavorful yet dense, not fluffy and airy as described. Yes, it’s a very thin batter. Adding extra flour would definitely throw it off. I used 8 inch pans, so 9 inch would definitely be thinner cakes. It looks so good! Can we make the mascarpone filling with chocolate? It’s my daughters birthday and I would like to bake one but she only likes chocolate! That should be fine. Just reduce the powdered sugar a bit and replace it with cocoa. Maybe 1/4 or half a cup, depending on who strong you want the chocolate. If I use 9×13 pan do I have to double the recipe? Thank you. I will make it for my cousin’s 18th birthday. No, this recipe will work for a 9×13. This cake was really good, perfect for spring! I was making it for someone else, so I couldn’t taste a piece, but I had small spoonfuls of frosting, filling, and batter along the way. I do have a couple questions though. First, the filling seemed a little sweet for me, but that’s just a personal preference since I like berry fillings a little tart. Should I just omit some of the sugar next time? Also, I had some trouble with the frosting not spreading evenly and clumping. Do you think I mixed it too long? I’m glad you were happy with it overall! Yes, you could just decrease the sugar in the filling a bit, if you prefer. As for the clumping, I could only assume that it was from the mascarpone cheese. I usually just add it to the whipped cream cold, but if you have trouble, maybe try letting it come closer to room temperature. Just be careful – if mascarpone gets too warm or soft, it can be hard to get it to firm up again. Lindsay did you use hot water or room temperature? Either is fine. I’d initially specified hot, but either way is fine. It won’t affect anything. It’ll hold up pretty well for several hours, I’d expect. Can you tell me what kind of tip you used to pipe the frosting? And will the cake recipe make enough for all 3 layers or is it just for one layer? Yes, the recipe is enough for all 3 layers in the cake. I used Ateco tip 808 for the swirls on top. Made the cake …beautiful to look at and delicious to eat!! Thanks for the receipe! Hi Lindsay! It is so interesting cake and I want to make it perfect. I have some problem with cake layers. I just baked it 3 times and it went to garbage. Maybe it is so a lot of liquid or not enough of flour because my layers are always like raw. I bake longer as you put time, and I just know my oven well because I bake cakes very often. I never baked layer with a lot of water and milk. Where do you think is problem? Thanks. I honestly don’t really understand why people are having this problem. I’m not sure how the cake is under baked if it’s been baking long enough. Since I can’t recreate the problem, it’s really hard for me to say. Feel free to email a photo of your result. Maybe looking at it will help me understand better? I only know that the measurements are correct and I’ve never had a problem. I really wish I knew what the answer was. I’m sorry. i’m going to try and make this cake for my mom for mother’s day but want to try and make it in advance. Would it be okay to bake the cakes one day, and then freeze them overnight and then take them out and assemble the cake the next day? Thanks so much for such an amazing recipe, i can’t wait to try it out! Sorry for the delay! For future use, if you are just making the cakes one day ahead, you shouldn’t need to freeze them. They’d be fine in a well sealed container (like a cake carrier). Oh my! This looks so incredibly delicious. I’m so making this for Mother’s Day. I also have one side question: where did you get that beautiful cake stand? I totally love it! I tried this cake and it was 50% a disaster. The cake portion was not very nice at all. I had to bin it and use another recipe which was also not to my liking (I am willing to conceed that I was having a very off baking day). With that said, The icing and the compote were absolutely beautiful and I will for sure make them again. I’m glad you enjoyed the filling and frosting. As for the cake, I truly don’t know why some are having trouble. I’ve had so many people have success and share photos of the final cake with me that I know the recipe itself is fine. Perhaps there’s a difference in elevation or climate that is making a difference for people? If you’d like to try out an alternative cake and see how it works for you, these vanilla cake layers are also great. I made this for Mother’s Day and everybody loved it! Thank you! How can I share a picture of it? Wonderful! So glad to hear it! You could always email it to me, or share it on instagram and tag me if you use it. Unfortunately there isn’t a way to add photos in the comments. My son made this cake for my birthday today and it was fabulous! Everyone loved it! So glad to hear it was enjoyed! Question can this cake be substituted with cake flour if so what’s the ratio ..Also I have baked a lot of cakes with baking powered, but never 3 tsp is this correct for this cake? The recipe is correct as written. I haven’t tried using cake flour, so I don’t know how it’d turn out. Do you think this would work as a semi naked cake? Is the frosting pretty dense? I would like to make is for my daughters bday party this weekend. Yes, I think it’d be fine. My frosting was plenty firm. Hi! This cake looks delicious and I would love to make it for my grandparents’ 50th Anniversary party… It needs to feed about 20 people and I was going to make it in a 11×11 Wilton square pan… I want to make the cake two layers and was just wondering if you thought I should double this recipe to make a bigger, two-layer square cake in that 11×11 pan. I also would like to add that this is by far my favorite website for baking recipes, you are amazing!! Thank you so much!! Thank you, Justine! I’m so glad you enjoy the site. I’m thinking that doubling it would probably be best. I hope you enjoy it! Eventhoug the cake looks fantastic! However I would reduce the ammount of sugar in half. I think the batter and the frosting are too sweet. I made the cake, this evening, but my layers are much thinner than what you have pictured. I bake, often, and have never had a cake with such thin layers:( I followed the recipe exactly as you posted. Any thoughts? The positive note is that it smells delicious! Hmmm, I’m really not sure. I’m sorry! Love this recipe, made it first time and the cake turned out very flat and dense but very tasty. I talked to a few people and they said it’s from over mixing the batter. Making another cake, this time I will add the water to the egg mixture instead of your method of mixing water into the already combined batter and use a spatula to mix with instead of mixer, I hope it turns out better this time. This cake was absolutely delicious and went in a few minutes….it is totally wedding worthy! I was a little nervous that the batter seemed watery but it wound up being the tastiest vanilla cake I’ve ever eaten. Great job! Wonderful – so glad to hear you enjoyed it! Thanks Danielle! Should the mascropone cheese be chilled or room temp? Im nervous chilled will result in lumps! Thanks! I would say chilled. The trouble with room temperature is that if it gets too soft, it can get watery and it doesn’t recover well. If you want to let it sit out for 5 or 10 minutes though, it should be ok. I made this cake for Mother’s day and it was a hit! I had never made a layered cake and thanks to your site I am hooked! Everyone was very impressed with this cake (even though mine was lumpy and uneven without the proper icing tools compared to yours). I just might have to make some purchases soon! Can’t wait to try another cake from your blog for Father’s Day this weekend! I believe I’ve had someone share a photo somewhere (maybe on fb) of this cake that they’d made as a larger cake. I think it was a 9×13. I haven’t done it myself, but it seems like it should work fine. Though might need to make some adjustments – like maybe more filling? 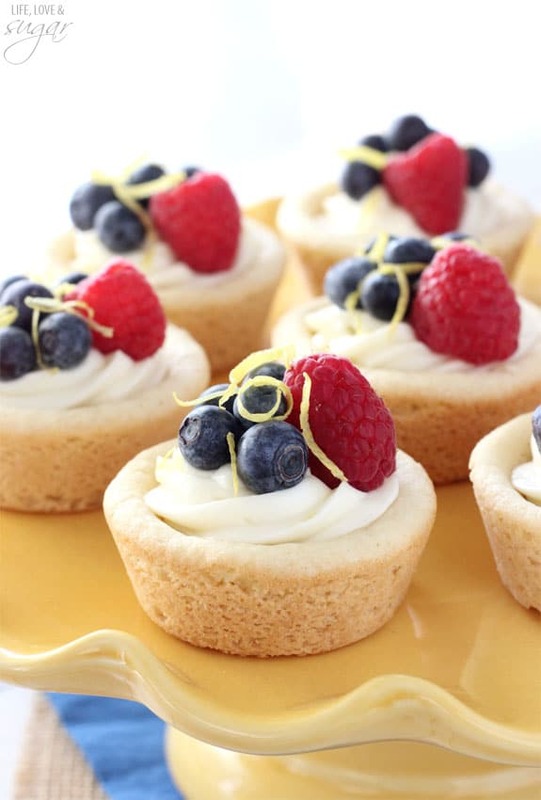 Have you ever tried using frozen berries for the filling instead of fresh? Also wondering g if you’ve ever tried adding a bit of lemon extract to the frosting? Thanks! As I was praying through an issue I felt the Lord give me this verse. When I feel the disappointment and doubt of a circumstance creeping in I lift this up as a breath prayer. Thanks for sharing! I haven’t, but I think some others may have and it turned out ok. Just be sure to pat them dry of liquid. I haven’t tried the lemon extract, but it sounds tasty. I made this for Mother’s Day and it was a huge hit!! I want to make it again, but I want to use two 6 inch cake pans… how would I alter the cake recipe? I haven’t done it in a 6 inch before. If you’re still using three cake layers, you’d need to increase the baking time a bit. So I made this for a 4th of July cookout. I actually baked the cakes about a month ago and froze them, this worked out so great , I just took them out and made the compote the night before the party and on the day I just had to do the frosting and assembly. I’m not a layer cake baker at all this might be my 2nd shot at that , but it came out great everyone loved it!!! Thanks I will defiantly do this again . Leah O. Made this for 4th of July. Sooooo good. Came out perfect. You have totally redeemed my experiences with blogger recipes. Just had 2 major disasters with 2 different sites, so I was nervous for this recipe ???? but it was perfect. I’ll be trying more of yours in the future. I just want you to know that I used your recipe to make a Vanilla Naked Cake with strawberry filling and regular Buttercream. I made the recipe two times because it only makes 2-8″ at a time. Both times the cakes came out fluffy and light. I read everyone post and many said, their cakes were dense. Again, I repeat…I did the recipe two times and it came out with the same texture. If I may, you can delete if you like. But, I made sure all my ingredients were at room temperature. Mixed till I didn’t see any eggs, 2 minutes, then added the hot water. Once I completed that step. I stopped the mixture and then hand mixed all the batter that was at the bottom. It came together creamy but loose. I hope this helps many!! To you the creator of this delicious recipe….THANK YOU!!??????????????????????????? ?May God Bless You abundantly for sharing His Word and recipes! Hi, can I use frozen berries? Some people have said they’ve used them and had success. You’d want to thaw them and pat them dry to try and get rid of excess moisture. I made this today – I made the berry sauce with just strawberries and it came out delicious! And I made a chocolate mascarpone icing modified from yours, also delicious! However, my cake came out short and dense and overly moist – we even did a second batch with my husband making it and same issue. Any idea what would cause that? The second time we left it in the oven a little longer to see if it would help it rise more, but nothing. We’re avid bakers, and It was a delicious cake just sad that it didn’t turn out. Made it today with my 4 year old. Amazing. I haven’t actually worked with neufchâtel cheese to be able to say for sure. I would think it’d be ok though. I’m planning on making this cake for a baby shower this weekend. Can I use a frozen Berry medley for the fruit filling, or would you suggest sticking to fresh fruit? People seem to have had success with frozen berries. Just thaw them out and pat them dry of extra moisture. This cake was amazing! This was easy and the cake turned out so light! Certainly a “keeper”! I don’t have 8 inch pans so I used 2 -9 inch and baked it for 26 minutes. I’m going to try this with a peach filling and add 1/2/almond flavoring of all vanilla. My family loved it! You truly have a gift. I have made this cake twice. It is so light and the texture is perfect. Absolutely delicious! The first time the layers came out thin due to using 9″ pans. Duh! if recipe calls for 8″ pans this will happen. This time I increased recipe by 1/2 truly pleased with layers. My husband won’t stop talking about it and refuses to share with others LOL! I’m sure it would be out of this world if I were to use mascarpone cheese instead of cream cheese but there was a cost factor. Keep the recipes flowing. Amazing recipe!!! So glad to hear you enjoyed it! Thanks Monique! I LOVE the icing for this recipe! I made it for the second time this weekend and it tastes like vanilla ice cream, but is so light and fluffy, AND it’s easy to work with. I was delighted to find Trader Joe’s has mascarpone for only $2.99 for 8 oz compared to $6.99 at our regular grocery store. It’s great to know I can make this icing all the time now without spending $14 on delicious cheese! I’m so glad you’ve enjoyed it! Great deal on the mascarpone too! This cake was incredible!!! The cake was so light, moist and delicious- not at all heavy or dense or even too sweet. This will definitely become my new vanilla cake recipe for any cake that I make in the future. The berry filling was also so delicious! And the frosting was unbelievable!! The perfect amount of sweetness and also light and so flavorful. Such an unexpected texture and taste with the mascarpone. People were freaking out at how amazing this cake was and so was I! Will definitely make again! Thank you!! Wonderful! I’m glad it was a hit! i have a few pointers after making this cake. Firstly, the filling was amazing, it came out perfect, I used frozen berries that were thawed out since the real berries are hard to find where I live. The frosting was also really good. I used cream cheese since the cheese is impossible to find where I live. But I would recommend whipping out the cream cheese before you incorporate it with the whipped cream because it leaves lumps in the whipped cream. Andddd the cake….. I don’t like this cake recipe at all. I was contemplating on using this cake recipe after reading the ingredients because it just didn’t sound right. And boy was I right. After reading comments that the cake tasted so good, I decided to give it the try. What scared me the most was all the liquids. It’s just too much liquids for a cake. My cake didn’t rise at all, so I had little “stingy” cake layers. My baking powder was good so it was not that it was expired. I think the over powerment of liquids is what caused it to not rise. After seeing them not rise I decided maybe the quality in this cake is the taste. Nope. After I assembled my cake and decided to taste it, not even the goodness of the frosting and filling can help it. It doesn’t taste good at all. 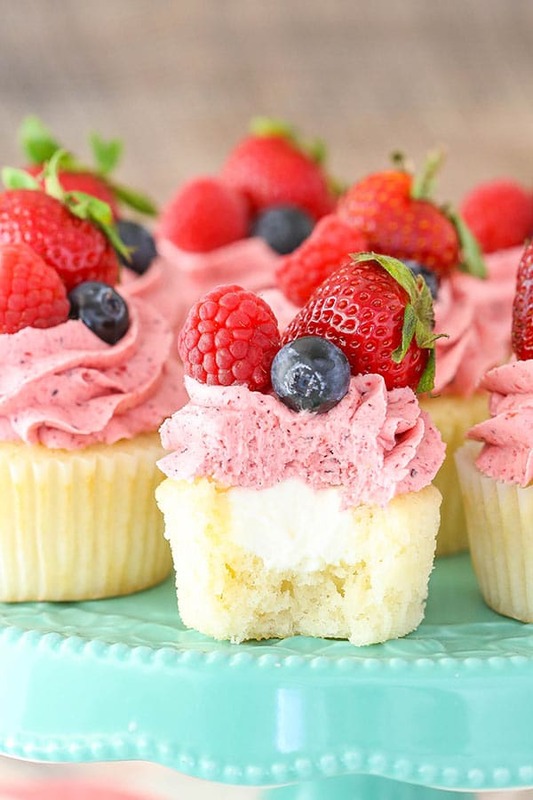 Hai, is it ok to only use two berries, blueberry and strawberry for the fillings? I love your work, I bake with your recipes often and it’s always a huge success 🙂 However, in my country layer cakes are made with sponge cake that doesn’t contain any fat or liquid, just eggs and flour and I don’t like it 🙂 What vanilla cake would you recommend from your recipes that is both moist and really really soft, like melt in your mouth? 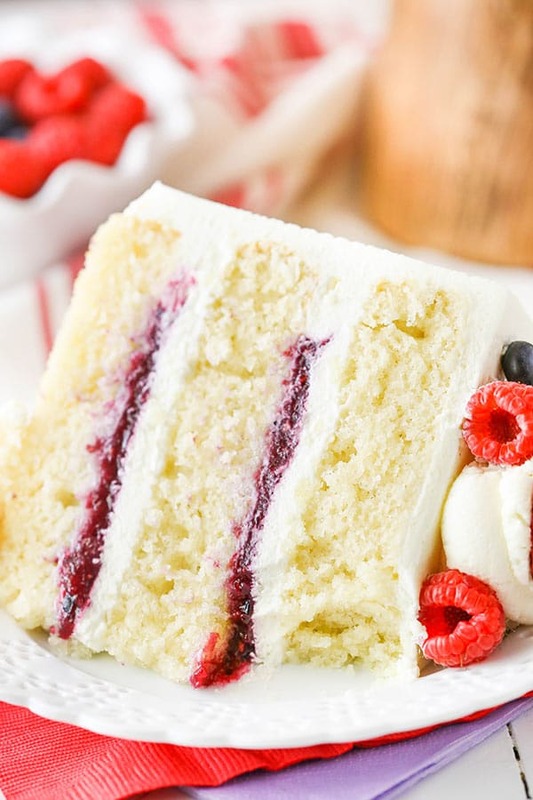 I am deciding between berry mascarpone or fresh berry vanilla cake or white chocolate raspberry. I’d love your suggestion which one I should try out 🙂 Thank you! I just made this cake for my sister and brother-in-laws 50th anniversary. It is amazing! A real show stopper. Thanks for the great recipe and easy to follow directions. I just made this for my son’s 12th birthday and it was a hit! I used raspberries, blackberries, blueberries and a few strawberries for the filling and decorated the top with everything except the strawberries (since my husband doesn’t like them). I did find that my layers were quite thin and with barely any dome, but then I realized belatedly that my pans were 9″ instead of 8″, so that helps explain it. They did have a dense, moist and almost doughy consistency similar to thick pancakes, rather than the lighter sponge you seem to produce — but I’m wondering if perhaps the people who’ve been experiencing this problem are all, like me, Canadian? If so, the difference in density is probably because our all-purpose flour has more protein in it than the US all-purpose. So Canadian bakers might be able to solve the problem by using Cake & Pastry flour instead. The other difference I noticed was that my icing was more of a whipped-cream consistency than the thick, frosting-like stuff shown in the video. Could this be a result of not whipping the cream enough before adding the mascarpone? I’m glad you enjoyed it! Helpful suggestions regarding the flour – thank you! I don’t know why some people are having trouble, but I imagine it’s some difference like that. The thinner whipped cream is hard to say from a distance. Did you add the full amount of powdered sugar? I use it to help stabilize the frosting. Also, I think that a stand mixer produces a firmer whipped cream than a hand mixer, which could be it as well, depending on which you used. I used the full amount of sugar and also a stand mixer, so not sure where I went wrong there. Maybe my mascarpone wasn’t as thick as the brand you used, hard to say. Still a great recipe, though! The vegetable oil in the cake threw me off a bit. I wanted to say that I would choose a butter cake for next time, but the cake was so darn good! The berry compote and mascarpone whipped cream are spot on! Made this cake (with a different frosting) for my sister’s birthday today and it was a huge hit! People loved it. I followed the cake and berry recipes to a T except I didn’t have any 8 inch pans on hand so used 9 inch. I do think 8 inch would have been better because the cake was a little dense and there was just generally more cake to go around (which who says is a bad thing ;). The berry filling was amazing, but I made the minor mistake of not pureeing the berries completely and next time I may strain the seeds out. Overall great recipe – thank you! Just wondering if this freezes well. Need to make a cake with a mirror glaze in October and this looks perfect. but I need it to freeze well. So does this recipe freeze well? like does the sponge stay nice and not go dry or soggy? I would imagine that’s somewhat a matter of opinion. I think it freezes fine, but if you’re looking for something specific, you might want to try it out. I found this cake on Pinterest and I just finished making it! Your recipe was easy to follow and your video made it even easier. I’m looking forward to eating it this evening at my mother-in-laws birthday dinner. AND, I can’t wait to make more of your fabulous recipes! Thanks Kim! So glad you enjoyed it! Can the frosting be made in advance? I’m talking about a few hours and chilled? I think it’s best when fresh and can loose a bit of it’s consistency when stirred again, but you could do it. I tried the sponge for the Mascarpone Berry cake a couple of times but ended up with an undercooked middle both times. The cakes sank as soon as they came out of the oven. What am i doing wrong? Also I find it a bit too sweet. Is it ok to reduce the sugar? A few people seem to have had that issue with the cakes sinking. I honestly have no idea why. It’s never happened for me, so it’s tough for me to troubleshoot it. It could be anything from elevation or oven type to something having to do with ingredients. I’mm sorry I’m not more help. If you’d like to try an alternative vanilla cake, the recipe for the cake layers in this cake are a great option. Will this make enough frosting and filling to cover a 3 layer 10″ cake… or should I double it? Depends on how have handed you are with frosting. It might be fine, or you might need a little more. Hi Lindsay, I’ve made this cake a few months ago and it was so good. 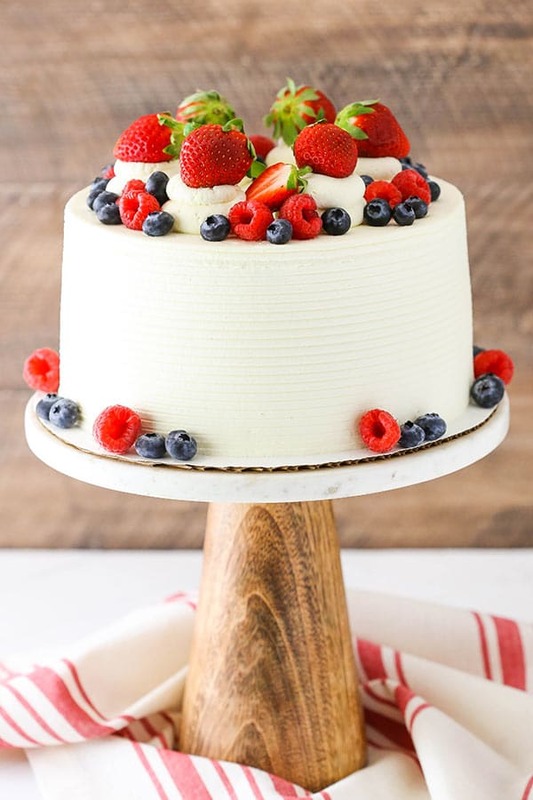 I’m planning on making a berry vanilla 3-tiered cake for January, and thought of this cake. Would you think the cake would hold up? Thanks. I haven’t made a tiered cake in quite a while and haven’t tried it with this cake, but I’d imagine that if things are well doweled and supported, it should be fine. Made this cake (2 of them as I had a large crowd) for my Dad’s birthday celebration. I received so many compliments on the cake. Everyone loved it! Thank you. So glad to hear everyone loved it! Thanks Julie! I just took this out of the oven, so can only comment on the cake. I doubled the recipe, put most in a long Wilton loaf pan and a cup or so in a reg loaf pan — couldn’t resist, I had to taste the little one. I love this cake! It is unlike any recipe I’ve ever made and I love the texture and the flavor. It is not “Betty Crocker”-like fluffy, but a firm, you-know-it’s-homemade texture. I plan to slice the long loaf into layers and follow your recipe for the fruit filling and the icing. Thank you!! Took the completed cake to a family Thanksgiving and it was, by far, the favorite!! It truly is one of the most delicious cakes I’ve ever made. I’m making another for a Christmas party. So good!! Hi, just wanted to say that your recipes are amazing and very easy to follow. Thank you so much for this platform. I made this cake today. It was delicious. What size coupler do you use for the 808 tip? I don’t actually use a coupler for that tip. Just add it to a bag. Hi, I was wondering if I was to make 4 layers, will the cake be stable and hold up if I prepare it 2 days in advance ? Are the layers a very light sponge which can’t withstand too much weight and Is the mascarpone frosting stable enough ? Would switching to a Swiss butter meringue frosting be a good idea? The layers might be a touch thin at 4 layers, but overall the cake should hold up. I have found the frosting to be stable in the fridge, but you could certainly use a SMB to be safe. Hi, Lindsay. I’ve made other recipes from you. My favorite was the chocolate pumpkin cheesecake, which is to DIE FOR! I’m not sure if the Reeses Cupcakes are yours, but it tastes better than a real Reeses. I made this cake for a coworker’s birthday and she loved it! The only thing different that I did was instead of the 2 cups of sugar in the cake, I only put in 2/3rds cup. I also added 1/4 cup instead of 3/4 sugar. My co-worker doesn’t like a lot of sugar and likes fruit. The frosting I didn’t change a thing. It was so light and really compliments the fruit. Was delicious! Thank you for sharing such wonderful recipes. My co-worker loved the cake, too. I did itg all in 1 day. Wish I knew how to send you the picture of the cake. Looks great. ???? the cakes are in the oven now and mixture has spilt all over the bottom of the oven. I’m not familiar with that particular set of pans. The 8×3 pans I’ve used before are 8 inches around and 3 inches tall, which is plenty tall for this cake. I’m sorry for the overflow – that’s a pain! I would think it’d be fine under fondant. I MADE THIS… TWICE! O….M….G it was incredible both times. It looks intimidating but really it is quite simple and worth the work. The vanilla cake is the best ever. So moist and filled with flavor. I have some tips; For the jam I cooked it only for 5 minutes on medium heat, I found that 10 minutes was too long and it made the jam too thick, that i wasn’t evenable to spread it. Also, if you would like to do light frosting, I personally halved the recipe. This gives you the perfect amount to fill the cake as well as pipe some designs but you won’t be able to frost the sides. Another tip is I added fresh sliced strawberries on top of each jam layer to add an extra bite. I also felt it needed the freshness, made it even better. I’m new to your page and am so excited I found this cake! 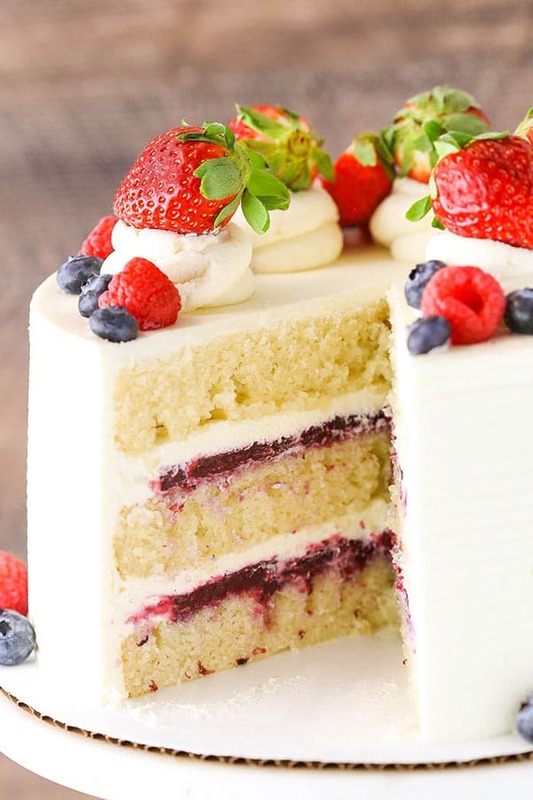 I want to make it with two nine inch pans but do you think I could do a second layer of the berry filling underneath the top layer of frosting? Can’t wait to try, it looks delicious and beautiful! The 9 inch layers should be fine. Not sure about the berry filling underneath the frosting. It might be hard to spread the frosting on top. You could add the second layer of filling on top of the frosting, in the center of the swirls though. I love this cake!! Have made it a couple of times. 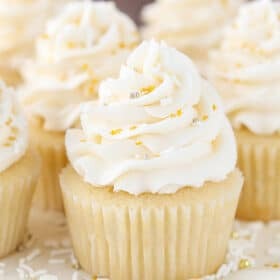 Is it possible to place small raindrop cutouts of fondant to the side of this cake with this whipped frosting? I’m glad you enjoy it! I would think the raindrops would be fine. They should stick. I’ve made this cake a few times and it’s a hit every Time! Love everything about it❤️. I just have one quick question. Will it hold up under fondant? Thanks! So glad you’ve enjoyed it! Not sure about fondant – haven’t tried it. I just baked this cake and my layers came out about 1.5cm thick which I thought was rather thin. Is that about right or did I go wrong somewhere ? how do your cakes bake? Do they dome like some do, ……………do you use baking strips around your pans at all…………. Hi Lindsay! Greetings from Indonesia! Thanks for the recipe! I’ve tried this it and really love it. The cake is so moist and soft. I would like to make it again with less sweet taste. Just want to ask you if I want to lessen 1/3 of ths sugar, what ingredient should I compensate it to? Please advise ya. There’s not really a good substitute for sugar that I know of. I’m not sure that it would have the best effect to reduce it. It could alter the texture and moisture of the cake. Your mascarpone frosting says the ingredients need to be cold/chilled. I’ve seen others say it needs to be at room temperature. What difference does it make? The heavy whipping cream definitely needs to be cold to whip properly. The mascarpone cheese is usually best when it still has a bit of chill to it. If it gets too warm (which depending on your “room temperature”, it could), it’ll be too soft and won’t firm back up properly. I hope that helps! This is a great recipe, used it many times in the USA with no issues, though I can get all the ingredients and I do not substitute ingredients. Making home made mascarpone is not like commercial made cheese. The home made version will be softer. I wonder if those having trouble might try some softened, unflavored gelatin to help stabilize the whipped cream. Keep in mind that heavy cream works best, 36% fat or more. 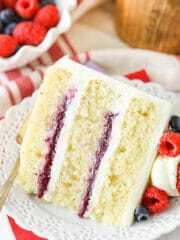 Thanks for sharing this recipe, its very similar to a local restaurant’s lemon berry cream cake and I just love it. Lindsay, you have the patience of a saint to answer all these questions. All great suggestions and notes! I’m so glad you enjoyed the cake, Michelle! Today I have the cakes baked to serve 50 for a party. The cream is whipped up and ready to apply and I have lemon curd to fill the layers too. But Im really worried about humidity! It rained last night and is still pretty drizzly. I am concerned about frosting, filling and transporting these cakes in such weather. I froze my cakes for easier assembly and am thinking I might just assemble them early in the morning and then quickly get them to the event before they can thaw. Ive had cakes melt in intense summer heat, but rain is something I dont have to cope with very often in southern California. Any thoughts? Hmm, yea I’m not sure. I don’t do events really. The frosting would definitely be sensitive to heat and probably humidity, being a whipped frosting. You might consider a regular buttercream, to be safe. I’m on a low carb diet, what would be the conversion to make it gluten free with almond flour or coconut flour? I’m really not sure. I don’t really work with those flours in cake. You may be able to find something helpful on this site, which is all low carb. Hey can I make cake like 3 days before the major event like if I get it ready on Wednesday and serve on Saturday? Will it be hold tyre icing and taste? That far in advance would probably be a little more than I’d suggest for it to be optimally fresh, but it should be ok.
And also with the cream cheese .. if I use it instead of mascarpone cheese .. can I make it 3 days early and refrigerate it until I serve it? This cake looks amazing! I would love to make it for a special family birthday coming up. Do you think it would work if I replaced the vanilla extract with lemon juice in the cake and icing recipes and added a little lemon zest? Thanks. The cake would probably not bake correctly with lemon juice added. If you’d like a lemon cake, I’d try using the layers in this cake. Making this for this weekend! What kind of milk did you use? I use 2% milk. Enjoy! Thanks for replying, I’m going to give this one a try! I made the frosting today to put on my coconut cream cupcakes and it was absolutely perfect. I followed the recipe exactly as written, used cheap mascarpone from Walmart, used a kitchenaid to whisk it, and it wasn’t lumpy or grainy, it was perfect. Didn’t chill the mixing bowl or whisk either, and it tasted wonderful. 5 stars!! This frosting was perfection and probably the easiest I have ever made. I have been looking for a stabilized whipped cream frosting forever and none of them stack up to this one. Could you play around with this recipe and make a chocolate version? Then share? I’m so glad you enjoyed it! For a chocolate version, you can sub some of the powdered sugar for cocoa powder. I’d try 1/2 a cup, or a touch more, depending on how chocolatey you want it. I must say that I used my trusty white cake recipe for the berry mascarpone layer cake. That being said the frosting is devine and will be my new go to. It pipes beautifully and isn’t too sweet. The berry filling…delicious. My family loved the cake and can’t wait for me to make it again. I just baked this cake, delicious, it turned out perfect like your pictured cake, this is a keeper, baked it in celebration of our granddaughter number 12 birthday on Easter Sunday! Hiya – I just baked this cake and I have a few questions if you’re still looking at this post . First off, I got a ton of compliments on it – the sponge texture was very light and fluffy, which was exactly what I was after and taste-wise it was perfect, although I think I added a bit too much salt – my fault! The filling was just lovely – mine turned out a bit lumpy but I think I overwhipped it and I think my mascarpone may have been too warm. The one issue I had was that the cake was quite difficult to work with – it was sticky in the pans, as you said, so I lined with baking paper. It came out of the pans fine but when I peeled off the paper it ‘clung’ to the paper and in some cases the paper pulled off chunks of sponge. When it came to icing I found the icing pulled off some of the sponge as well. Do you have any advice to prevent this in future? I was thinking a crumb coat for the icing troubles, but for the baking paper removal do you have any advice? I tried to do it really gently and slowly but I’m wondering if something else could help! When you say baking paper, do you mean parchment paper? I find that works best. You could try also spraying it with baking spray. I don’t remember having that issue with the icing and crumbs, but definitely a crumb coat would be a good way to prevent that in the future. So glad you enjoyed the cake! Hello! Could cream cheese be substituted for the mascarpone as it is hard to find where I am and pricey? Thanks! With so many reviews, you may not want anymore, but I just have to let you know… I LOVE this cake! I made this for my husband’s birthday. He’s so good in allowing me to try something new for his birthday, and this is what he chose. The cake was nice and moist and had a great crumb, which I was kind of surprised about, because the recipe calls for regular AP flour, instead of cake flour. The cakes domed so beautifully when they were baked. I also loved how easy and fast the cake was to prepare. For the filling, I only used raspberries and strawberries, since my husband isn’t a fan of blueberries. The recipe didn’t say to strain the seeds, but I did anyway (in your pictures it looked as if you did). After following the recipe, I had more than 2/3 cup of puree, but I used all of it, and it thickened just fine, and turned out great. The frosting is delish! I love that it’s a combination of a “cream cheese”-like frosting and a whipped cream frosting. It wasn’t overly sweet, and it’s great to pipe with. I’m just so pleased with how well this cake turned out and how delicious it was. Thanks so much for sharing this great recipe! I also need to add that I used whole milk. I also used mascarpone straight from the fridge, and it whipped up just fine. I greased my pans, put down a circle of parchment on the bottom, greased the paper, and floured them. I had no problems with the cakes sticking to the pans. And I didn’t find the cakes too sticky to work with either. So glad you enjoyed it! Thanks for sharing your experience! the recipe didnt call for baking soda. is it correct? water mean boiling water or room temperature ones? Yes, it’s correct. Room temperature water. This is my first comment on a Blog site – but this cake requires a comment! Absolutely DELICIOUS cake – followed directions to a tee, and it turned out just amazing. I made it for a friends birthday and it was so popular that it was asked for again for my sisters birthday, and my daughter just asked for it for her birthday! I have never made this type of frosting before, but it is a new favorite. If you want folks praising your bakery skills you need to make this cake! Thank you for making me look good!! Hi! If I wanted to make 1 10″ cake and 2 9″ inch, can you tell me how to adjust the recipe? I’m really not sure how much batter you’d need off the top of my head. I made this for my son’s birthday party and it was a huge success! This is honestly one of the best cakes I have ever made and the frosting is my new favorite! Thank you so much for sharing it! I made this for Mother’s Day and it came out fantastic. Thanks Lindsay! This looks delicious, I can’t wait to try it! Could I use frozen berries and leave out the water for the filling? Or would it make the sauce too runny? You could try frozen – just be sure to pat them dry to remove water, as you mentioned. Hi! This recipe reads like a dream for my husband’s birthday cake. I was wondering if I halved the recipe, what size cake pan do you recommend using? I’m not really sure – maybe a 6 inch? Hi Lindsay! Me and my daughter had something similar when we ate at an Italian restaurant. It was a Triple Berry Tiramisu. The restaurant has since closed but I have never forgotten how yummy the tiramisu was. Your cake sounds very similar to what we had so I want to try it this summer. So I’m a fan of mayo cakes. I make all of my cakes with 1 cup of mayo. What are your thoughts on replacing the vegetable oil with mayo in this particular cake? I honestly haven’t ever made a cake with mayo, so I really can’t say. It’s something I should probably try at some point. This cake was so good!!! I’ll be making it again for sure. Question – if I made the cake in a 9×13 pan, how long should I bake for? I believe it’d be around 30 minutes. Going to make half that batter for 12 cupcakes. How many mins at what temp? You can find the cupcake version of this recipe here. I love to make cakes from scratch. I have been searching for a moist yellow cake, that doesn’t dry out as soon as it cools, as well a a whipped icing that holds up. I made this cake and have to say it was everything I hoped it would be. Super moist yellow cake and a hearty whipped frosting that doesn’t mush out when layered. Love, love, love this recipe!!! what is the purpose of having the water and the milk? Can additional milk be substituted for the water? Milk has fat that water doesn’t have. Water adds moisture without the additional heaviness of more fat. If you swap out the water for milk, you will change the texture of the cake. But you can do it, if you like. Thanks for the response. That helps me to understand! Will try recipe as written. Thanks again. I made this cake for my sisters birthday. Wow! This was so good. I got so many compliments on the cake. Best frosting I have ever made. I’m so glad to hear that! Thanks Angela! I just made this cake, and I was so excited, but it just didn’t turn out. Okay, so my cakes did, but the frosting was a complete goopy mess. I even added extra powdered sugar to try to thicken it, and nothing. THe cakes just kept sliding off each other after attempting to frost and fill. Any ideas? It all went in the trash. Super bummed. I would check out this post that talks about that whipped cream frosting specifically. It sounds like the mascarpone cheese might have been too warm. Love this cake! My family’s favorite. How long will the berry filing be good for after it’s been made and refrigerated? I’m so glad to hear that! I haven’t tested it to be sure, but I’d think it’d be fine for at least a week or two. looking delicious!!! Nice Foodography also!! I made this yesterday and followed the recipe precisely, except that I had difficulty finding marscapone so I used cream cheese. It was DELICIOUS! We loved it. 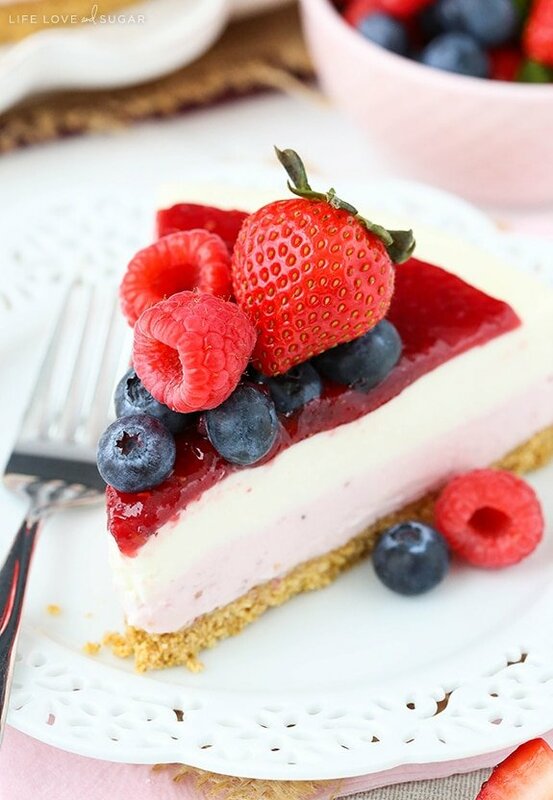 The berry filling is the best part. I used 1 cup of raspberries and 1/2 cup of strawberries. It was divine! I didn’t have any issues with my cake. It was moist, light, and cooked perfectly. I sprayed my 8 inch cake pans with an olive oil spray (because I didn’t have baking spray) and I put parchment paper in the bottom of the cake pan. They came out just fine! My icing was a little lumpy but it tasted wonderful. Next time I’ll put the cream cheese or marscapone in the bowl first and mix it by itself to get some of the lumps out and then I’ll add the other ingredients. I think that would help. I will be saving the recipe and making this again. The flavor was great! The berry filing makes it really special. Oh to be able to bake like this. I bet I’d have red fruit stains on everything but the cake. You are fabulous and make it look so easy. I never leave a comment but for this I must!! Made this cake over the weekend and I must say AMAZING!!! Cake was moist and frosting was light and delicious!!! I am so glad I stumbled over this website:) thank you for posting such a great recipe. Do you use hot water for the cake recipe? You can use whatever temperature water. I made this cake for a friend’s birthday this week. I had never made it before so I was a little worried about the outcome. Everyone loved it! Even my husband raved about it! I was so proud and happy! Thank you for all your wonderful recipes! I’m so glad to hear you enjoyed it! Thanks Angelica! Is the venue inside? If so, then it should be fine. If it’s outside, I probably wouldn’t take the chance. I love your blog and your recipes are just fabulous. I am not a cake/baking kind of person but I decided to take the plunge and try out this berry mascarpone layer cake. I am actually in the process of making it. I followed the recipe to the letter but my vanilla cake is very dense and I am wondering what I did wrong. I was wondering if the lean milk i used might have affected the result. It’s 0.4% fat, should the water be cold or lukewarm? I’ll appreciate your feedback so I can do it better next time and get that light airy result. Hi Marvis! I’m so glad to hear you enjoy the site! I’m sorry you had trouble with the cake layers. It seems that some people have trouble with it while others don’t and it doesn’t seem to be an issue I can recreate, so I’m not sure what’s causing it. I wouldn’t think the milk or water temperature should make a significant difference. I’ve used warm and cold water before. I typically use 2% milk. The cheeses have different textures and flavors. You can use cream cheese here though, if you like. Just use the same amount. I cut my 3 cakes into 2 layers each and then doubled the filling as well as the icing. This made for prettier presentation, very yummy cake! Sounds delicious! I’m glad you enjoyed it! Hi! I was wondering if this cake could hold up with fondant covering it? It’s looks and sound delicious! I’m really not sure. I haven’t used fondant much lately. It’s a fairly moist cake. If I were to cover it in fondant, I’d probably use ganache underneath. OMG! You’re site is amazing. I love the detailed videos. It’s very inspiring. May I ask what set up do you use to record your videos and edit them? Thanks for everything sweet! Thanks Jenna! Gosh, it’s hard to explain the whole set up and I haven’t been doing my more recent videos myself. But I usually have a camera on the side angle and one overhead. I use Canon 6D cameras with a 100mm lens on the side and 24-70mm lens overhead. I edit with Adobe Premiere. I have not tried the recipe for the cake thus giving it only a 4 star. However, the berry jam ( I use strawberry, raspberry, and blackberry) and the mascarpone frosting was a really good combo. I made a white sour cream almond cake to go along with the berry filling and the mascarpone frosting and it was a hit! 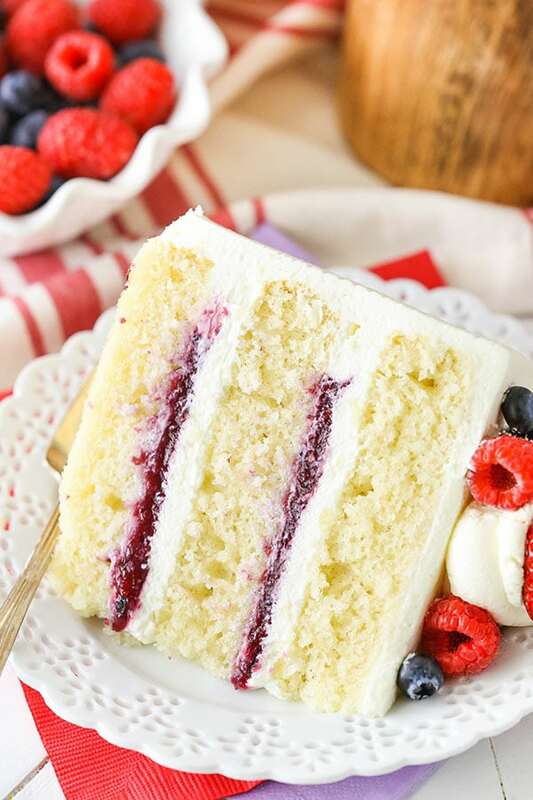 The frosting is not overly sweet so it didn’t overpower the sweetness of the cake while the berry jam gives a hint of tartness making it all comes beautifully together. You just want to keep the whole cake to yourself. I’m so glad you enjoyed the filling and frosting! I am not a baker! And have never had success with cakes from scratch. But I bit the bullet and made this…..with great success. OK, it didn’t look perfect as pictured but it was fantastic. The cake itself was so light and moist. The directions were easy to follow. At the end of the day, I FELT like a master chef! Thank you for sharing! I”m so glad you enjoyed the cake! I have made this amazing cake several times. Everyone loves it!!! I am now going to make it for my Niece’s wedding. Wondering if you have any tips on slicing it so I get clean pieces? Also, 1 time I was doing the frosting and i think i whipped it too long……any tips for knowing the perfect time to add the mascarpone? Or can it be fixed if it happens again? I’m so glad to hear that! Clean slices is hard to say – the filling is naturally going to kind of move around during slicing. What happened when you whipped too long? I typically add the mascarpone when I notice that the whipping cream is starting to hold it’s shape but isn’t really thick yet. Hi! I’m hoping to make this cake this weekend for a special event but want the cake a bit taller. If I 1 1/2 the recipe and made it into 3 8 in layers that it would mess with the consistency of the cake? Possibly. I’m not entirely sure. That amount might still be fine. Often if the layers get too thick, they can end up dense. This cake was phenomenal! I made it with 9 inch pans because that was all I had, which made a wider and thinner round cake, BUT that was to be expected. I made no changes to the actual recipe and everyone LOVED it and RAVED about it! The cake was devoured in minutes. It was my first layer cake and i will be making it again for sure!! I will be making more of your recipes in the future! So happy i found your website! I tried this cake for my daughter’s birthday as she loves mascarpone cheese. It turned out to be awesome. I tried icing first time as well. Only change I made in recipe was to use my go to eggless vanilla cake recipe as we don’t use eggs. Totally in love. Made it again for a cousin’s birthday. Love the recipe. Wonderful! So glad you’ve enjoyed it! This looks amazing! I’m thinking about making this for my birthday in a few days. I was wondering if I had to cut the recipe if I use 6in round pans? Maybe if I use 4 6in pans it would be ok but I don’t want to make it too tall. I honestly haven’t made any 6 inch cakes, so I’m not sure how to advise. I’m sorry! That’s awesome! I’m so glad you enjoyed! Hi! The cake looks really good. Will this work for a tres leches cake? I really haven’t made a tres leeches cake, but I think this cake base should work fine. Hello! Baking your recipe as I type ???? Just wondering if I wanted to use less sugar in the frosting, can I use dry milk to help stabilize it? Thanks! I haven’t tried it. It could alter the texture and taste of the frosting. If I could give it 6 stars, I would. This was pure heaven!!! Wonderful! Glad it was a hit! That’s awesome! I’m so glad it was a hit! Hi, I got only one mold, so can the cake wait for the other cake baked? Then only continue with the second and third layer of cake? I made this for my daughter’s 15th birthday. She loves berries so it was perfect. My whole family absolutely LOVED this cake. It was so fresh tasting. The sponge itself is surprisingly moist. We are not frosting people, but it was delicious. We cleaned our plates. Thank you for this recipe. It will become our go-to fancy cake recipe. Can yo use light olive oil instead of vegetable oil? This cake is amazing!!! My husband doesn’t show much emotion, but he is still raving about this cake. My mother (who is 80) said it was the best cake she ever had. I followed the recipe exactly and it came out perfect. I’m new to baking and this recipe has given me the confidence to keep on baking. Thank you! I had the dense Cale problem too but it was moist which is hard to achieve at this high altitude. Aside from the heaviness of the cake I thought the flavor was great and the edges did get a little crisp but not a lot. I used aluminum cake pans and it wasn’t overly brown. It’s possible the cake cooked too fast. I know the altitude does mess with baking so that is likely the problem. I’m going to try the cake recipe with butter next. The fruit jam turned out great with the amount of cornstarch I like sweet things so the sugar content was fine with me. The frosting was delicious too I used a little less than 16oz of cream cheese with it. Dense cake my phone keeps correcting me to Cale. 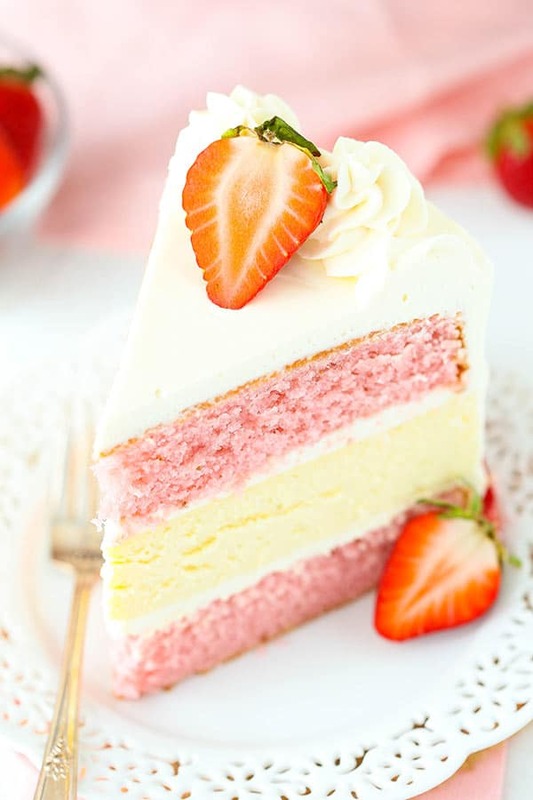 I’m looking to use the filling in a cake I’m making for Valentines Day (using 2 layers I froze when I make a 3 layer cake but just needed 1 layer). I wanted to make it with all strawberries. Do you think that would work? Also, how far ahead can you make the fruit filling? I’d like to make it a day or two ahead and then keep it in the fridge. Any issues you see with that? Thanks! PS This recipe was recommended by a FB group I’m in. She loves the filling and recommended I try this one! Yes, all strawberries would work and you could definitely make the filling 2 or 3 days ahead. I hope you enjoy it! So glad to hear you enjoyed it! Thanks Cynthia! Have you ever tried this recipe with a chocolate cake instead of vanilla? I’ve got a friend who loves chocolate and raspberry, but I want to still be able to to do a little decorating on the exterior. Thanks! Such a great recipe! And so simple! And that frosting is to die for, never tasted any frosting I like better! just made this cake today and is so fluffy and moist! I am wondering though.. as I let my cake layers cool the tops and bottoms of the layers became sticky and soggy-is.. do you have any idea why that’s happening? is that normal? First cake from scratch I ever made. Thank you for the delicious recipe. My family love it and appreciate it very much! Can I substitute cake flour in place of all purpose flour? I haven’t tried it with this particular recipe, so I’m not sure. can i substitute buttermilk in place of milk. If not does the milk need to be whole? I haven’t tried buttermilk with this cake to know for sure. I used 2% milk, but whole should be fine. Hi Lindsay ! I have several questions. Do the cold ingredients have to come to room temperature first ? I always struggle knowing if I can use ingredients straight from the fridge or if I should wait. I am also considering using frozen berries but am concerned about water content. I often do what you aren’t supposed to do and use cold ingredients. 🙂 So unless it says to use it at room temperature, I don’t. As for frozen berries, it should be ok. Just thaw them first and drain the water. I haven’t tried the sunflower oil, but I assume it’d be fine. As for the powdered sugar, you could reduce it a little bit. Just be aware that it also adds some volume to the frosting, so you’ll end up with a little less to work with.